Winemaking: Art, Science, or Process Management? Analyzing this approach begs the question: What comprises quality winemaking? … or tight process control? Does a winery’s story really need to capture the imagination to draw a clientele? I have been through dozens of conversations with winery owners, winemakers and marketing managers on this topic. One thing is clear, a message helps. Which of these messages do you think drives marketing success in the wine industry? Such a premium product, reflects a winery working with superior fruit, utilizing experience and process/quality management to deliver ultra-premium wine. Whether Mr. Capiaux views this philosophy to be his “passion” (or not), O’Shaughnessy needs to tell this story. The workman-like commitment to quality is what starts with great fruit and delivers great wine. Below, you will find a photo of the beautiful wine library in the caves at O’Shaughnessy and the winery tasting notes for the 2016 release. By the way, yes… that is me you can barely see in the back of the first pic! Our first visit many years ago commemorates our initial understanding of value in this price category. The absolute commitment to quality is demonstrated in every level of these organizations and the sensory experience brings your enjoyment of wine to an entirely new level. If you are ready to take the plunge and begin your research into this price range, you will soon come to understand why Pride holds a special place among these producers. That same visit initiated our palate’s introduction to “mountain fruit” wines (red varietals grown in steep vineyards at higher elevation). It was a match made in heaven and we have consistently sought out similar producers since. If you are looking for complex, highly structured Cabernet Sauvignon with black fruit flavors, look for estate wineries on the mountain ridges overlooking Napa Valley. Pride is one of the very best of these producers. That trip also introduced us to “ultra-premium” Merlot. Previously, we had thought of Merlot as cheap, easy drinking wine. We spent a half-day at Pride on that visit. I won’t go into all the details, but the attendant made sure we wouldn’t forget the experience. 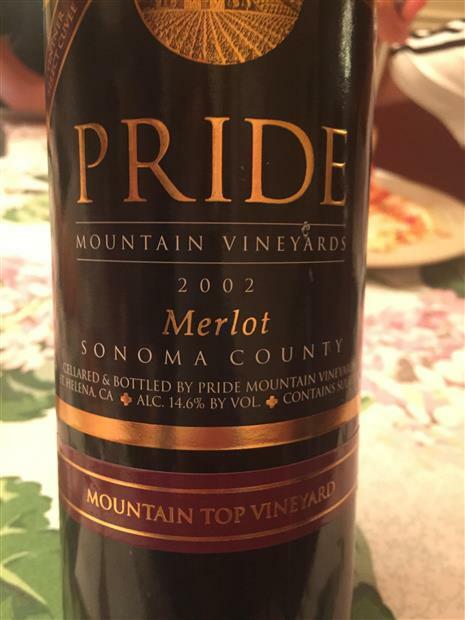 The Pride Vintner’s Select Merlot represents the very best of the Merlot that the United States has to offer. Plum and blackberry in front, luscious amazing mouth-feel with high acidity and tannins… drink one of these 6-8 years after release and be prepared for something special. We had an experience that day that my wife and I still talk about. That trip celebrated our introduction and graduation to a category of very special wines. There are a couple of outstanding Merlots made on Spring Mountain and I really enjoy converting our friends…. I hear from so many Cab Sauv drinkers the mantra of how terrible Merlot is… then I break out my Coravin and give them a taste of the way U.S. Merlot can taste. Proud to say, I am batting 1000 with conversions. Merlot CAN be excellent outside of Bordeaux, France. I had been looking forward to interviewing Sally for months. It was difficult to coordinate our schedules, but in the end I am glad we were able to settle on a date at the winery, rather than an interview on the phone. The setting brought back good memories of our several enjoyable visits in the past. Sally was very welcoming and she was kind enough to give us more than an hour of her time. I struggled a bit with how to approach this piece and finally arrived at the answer… skip the typical qualifications and background. Sally is a classically trained winemaker and all that brings with it. I decided to explore the story of the 2011 vintage year in Napa that she shared with us that day. I found this story fascinating and an insight into the stress some years can bring to farmers/growers with any crop. 2011 was an unusually cool year in Napa. The fruit was not ripening on schedule and the producers in Napa were bracing for a sub-par year. Syrah, Zinfandel, Merlot and Cabernet Franc can produce fairly good fruit in cooler years, but Cabernet Sauvignon has specific needs and tends to require hitting just the right conditions to produce a high level of quality. So, it was a real nail-biter for producers focusing on this varietal that year. This story requires a little background on the importance of harvest timing in a cool vintage year. Red grape varieties in particular are very dependent on total hours of sunshine for development of not just sugars, but also flavors and structure. If you pick too early, Cab Sauv can be thin, vegetal and very rustic. If you pick too late, it can be too alcoholic, flabby and taste like grape juice. If a grower waits too long, they also run the risk of the rainy season coming early to Napa. What happens if it rains during harvest? First, the berries actually absorb the water and the rain affects the concentration of flavors in the wine. Second, (and the scary one) the moisture can induce the propagation of mildew. Mildew can easily destroy half of an entire year’s crop. Other growers started harvest… but Pride decided the fruit in their vineyards didn’t meet their standard of quality… yet. Everyday, the decision had to be made to harvest early and suffer a poor vintage, or wait and potentially experience the financial pitfall. Then it started to rain. The forecast was for continuing rain and fog that week. Sally and the Pride team took the gamble and made the decision to wait it out. After a couple days of rain the clouds cleared on the mountain top, while fog continued below in the valley. This reprieve gave them enough sunshine to dry the grapes and add more ripeness to the crop. Unfortunately, many growers below made the wrong call and suffered the consequences. Some wineries settled for fruit harvested too early that year, or sourced fruit from outside the area. In addition, many growers and estate wineries suffered crop loss, due to the rain and fog. I tasted their 2011 Cab Sauv on that trip. It wasn’t their best vintage, but Sally worked with the fruit (instead of fighting it) and produced a high quality wine. Compared to many other Napa Cab Sauv’s we tasted from this difficult vintage, it was a masterpiece of winemaking. I was very impressed. Sometimes a little luck (and a well thought-out gamble)… makes you look awfully smart! The nose is full of rich, plummy aromas and a touch of alcohol. Still fruit-forward, with candied plum and black cherry in front with rich dark chocolate dominating the mid-palate and finish. The tannins were almost completely resolved, but there was still good acidity. The mouth-feel was soft and velvetty. The wine held-up well for 13 years in the bottle and was a pleasant accompaniment to the braised short ribs in balsamic reduction. This Merlot was a couple years past its prime, but still very enjoyable. The structure supporting the wine had started to weaken with age, confirming my past experience with well-made Bordeaux Blends from Napa hitting their prime drinking window in the 7-10 year range. A beautiful well-made wine, with the fruit holding-up, after so much time in the bottle. David Ramey, his family and staff were tremendously welcoming. Hospitality is one of those seemingly inconsequential things, but a little goes a long way… This visit was about more than the wine and more than the education. I will remember the interview, because of the way my wife and I were greeted, made to feel at home and offered a real opportunity to know the winery, its product and the people. I came away from the nearly two hours spent together, with a rather in-depth understanding of the philosophy and style of winemaking at Ramey Cellars. David has been working in wine production for decades and today he is one of the most well-respected elder statesman of the Northern California Wine Industry. He received his MS in Enology from UC Davis in 1979, before it had developed its reputation as one of the leading wine science institutions in the world. David then did his harvest internships with Jean-Pierre Moueix in Pomerol (Petrus) and later Lindemans in Australia. His career began with a position at Simi Winery, where he would become winemaker, as with Matanzas Creek, Chalk Hill, Dominus and Rudd later, before starting Ramey Cellars. David leverages almost 40 years experience in producing premium and ultra-premium wines in the product he brings to market today. Younger winemakers looking to make premium wines seem to be gravitating towards small production estate wineries. They are trying to emulate the classic “winegrower” concept that is seen often in Europe. I like the word “winegrower”. It acknowledges the role of terroir, and fruit quality WITH winemaking experience and skill. As a Sommelier trained in the last five years, this seems to be the current direction formal wine education is taking us. After speaking with David, I am not so sure this is entirely the correct path. For those that have been following my blog, in a previous post, I explained the three primary philosophies I have identified in winemaking: 1) Focus on growing the BEST fruit, 2) Focus on the Chemistry, 3) Focus on the winemaking technique (see more at this link: LINK). David is both feet in with #3. David works with the viticultural consultant Daniel Roberts to partner with his fruit producers. He and Daniel source the fruit from several of the oldest farming families in the Napa-Sonoma area, depending on the quality they produce. This is to ensure he can spend his time focusing on the winemaking, rather than the vineyards. Initially, I was trying to reconcile this thinking with my training, then I tasted through the wines and it became clear, but more on that later. Without pulling any punches, David gave me a run-down on fact versus fiction – Ramey style. In his mind, the current winemaking trends in the area were nothing more than recycled techniques and old-world ideas being introduced again as new. We walked through a long discussion reviewing them, such as: extended maceration, automated spray pump-over, extended aging on the lees. It was hard to argue with his interpretation, after the historical perspective provided. He also was very dismissive of the “better wine through chemistry” concept, although he does utilize some of the technology. The success of his approach is completely driven by his vision for the final product. When you have as much experience as David, deciding how to accommodate vintage variation is a challenge, but not a show-stopper. In 2011, Napa had late rains and a very cool year causing many vineyards to either fail to fully ripen, or mold. I tasted a few of the Ramey 2011’s and they were very good. This was unlike some other prestigious Napa estate producers (like Shafer) that did not fair as well in 2011. A conversation with David is a lesson in winemaking. Tasting the result is his validation. The approach is classic and very Old World. The emphasis is on finesse and balance. The result is exceptionally refined wines. The red Bordeaux varietals and Chardonnay stand out. The couple of others seemed a bit awkward. David focuses on natural yeasts, extended contact with the lees and a soft touch with the wine during production. He has very traditional ideas about oak aging. The result is very classically beautiful wines with great mouth-feel and structure. Ramey Cellars is also very traditional in other ways. The majority of their production is sold through the 3-Tier Distribution System… less than 15% is Direct-to-Consumer. Another major difference from current trends in premium Napa-Sonoma wineries. Although, they are currently planning to build a Consumer Tasting Room that is due to open in 2017. Perhaps an indication that wine & spirits distribution has been increasingly ineffective at promoting individual wine labels? Tasting so many well-made wines was an amazing experience. I won’t go through each individually, but try to hit on the highlights. The latest releases of his single vineyard Chardonnays were all excellent, in the Burgundy style, with good structure and fabulous mouth-feel. The Hudson Vineyard was a richer style, better as an aperitif. The Ritchie Vineyard was more acidic and would be excellent with salads and seafood. We tasted a couple of the 2005 Chardonnays. Wow, did they age well. The Ritchie Vineyard was down right gorgeous. The 2012 Cab Franc was a beautiful surprise, soft and spicy with great lift. The Pedregal Vineyard Cab was the best of the 2011’s in my opinion. All of the 2005 Cabs tasted were excellent. The bottle-age produced a 2005 Oakville Cab that was rich and beautiful, without losing its elegance. David offers an Old-World approach to his reds, with just enough fruit on the attack to make the wines a fusion of Old and New World wine styles. If the opportunity arises, try these wines. Many were very good, but David’s Chardonnays are truly exceptional. Make the effort to seek them out… if you are interested in sampling what the Napa-Sonoma area can produce when a complete focus on balance and elegance is applied. I hope I have been able to convey how special the whole experience was and how appreciative I am of having had the opportunity to engage a truly inspired classical winemaker! Winemaking: a Lifestyle, or a Profession? Spending a brief hour with Todd Anderson introduces you to a world that spans decades of Napa Valley winemaking history, introduces you to big personalities, samples a unique view of the industry and paints the Napa wine scene with the broadest of brush strokes. This interview produced so much material, I found it challenging to capture in one piece. Todd relishes his reputation as an industry “bad boy” and fashions an anti-hero image in a world of successful traditionalists. He shrugs off the big money and stiff, formal world of European influenced wine culture and views himself as the ambassador to the every-man… spreading the idea that wine can lead to a richer, fuller life. In Todd’s world, life is all about good food and wine, sharing it with good people and enjoying the lifestyle that accompanies it. Grasping how this view affects his perception of the industry is a key to understanding him. He is a complete contradiction, as he maintains an unpretentious, down-to-earth persona amidst the culture of big-money clients… tagging along to share his “wine provides the best life has to offer” experience. Todd has taken up the gauntlet, determined to convince the average wine drinker to justify a personal wine cellar and teaching them how to build it… with the idea that wine can add fun to your life until the day you die. You don’t hear the word “fun” very often associated with wine. I thought it was an interesting choice of words. Todd was introduced to fine wine by his father, learning to appreciate Bordeaux and Burgundy from his collection. Although he developed a palate for these wines during his younger years, it didn’t occur to him that it could be a profession until much later. He began his career out of college as a trained geologist working in oil and gas exploration. After being promoted to a desk position, he found himself longing for the outdoors and the idea of farming occurred to him. He had grown up on a farm and understood the profession and the lifestyle. So, finding 40 acres of prime Napa Valley land 32 years ago, Todd took the plunge. With a 7 year interest only loan, he planted vines and started growing wine grapes, planning to farm only. As the vineyard matured, he made the decision to produce wine and fortunately, his first Cabernet Sauvignon release was a critical and financial success. As the financial pressures began to ease, he began to hit his stride. As a geologist, Todd’s first approach was to evaluate the soil and determine the effect on the vines at root level. He found his acreage to have roughly 5 different soil types. This led to the planning for five separate vineyard blocks. As he experimented with the vines, he developed the optimum trellising strategies and vine orientation (to the sun), while choosing the appropriate dry-farming versus irrigation approach needed for each block to produce premium fruit. Later he came to understand, vineyard management was only one piece of the puzzle to producing premium wines. The key to a successful wine is focusing on mouth-feel. Another of Todd’s passions is the super-premium category. He felt the need to prove that he could succeed in this top-end price range. For many years, he disagreed with the “old guard” in the Valley regarding accessibility to these “cult” wines by the public. He was of the opinion that these producers did no service to the Napa Valley area wine community. While the exclusive nature of these wines is understood and all are on supply allocation at a cost that is prohibitive for most… he believes the public should still be able to taste them on-premises. This viewpoint eventually gave rise to the motivation for establishing the super-premium Ghost Horse label. Its success was a surprise for many in the industry, but for Todd, he never had a doubt. This idea of public accessibility to super-premium wines pushed our conversation to the wine bar business model. His frustration with this segment of the industry was very evident. How can the industry graduate mid-tier buyers to the premium wine category, if these wines are not available to taste? I agree whole-heartedly. If I could taste Sassicaia, Mouton-Rothschild, Margaux, Harlan Estate, etc. at $50 – $100 for a 2 oz. pour… I would do it on special occasions and I think many others would too. The misguided idea that wine bars and restaurants need to cover their bottle cost with the first glass is idiotic… It was then that I brought up the Coravin. Todd says ACVV was one of the first wineries Coravin approached to test the device. We both agreed, the Coravin solution should be changing the wine service industry and were perplexed by the slow adoption. Todd is all about people and the wine experience. He does not just make wine, he lives the wine lifestyle. He enjoys making friends and opening his world to different experiences and ideas and of course, all of this is enhanced by the shared enjoyment of wine. He offered an impassioned justification for spending a percentage of income on wine and the importance of buying at least a ½ case at each purchase (sampling as it ages). He then stepped up the intensity a notch and spoke of the life-changing affect a well-stocked cellar can have on quality of life. I have to admit, this guy is a very effective spokesman for the wine lifestyle. He enjoys travel promoting his wines and meeting people at the winery. Todd insists wine tasting appointments at the estate be friendly, welcoming and make wine accessible to the general public. He has had visitors cancel their plans and spend the day at the winery, getting caught up in this “life is better with wine” experience. Having been to one of these tastings, I highly recommend a visit. It is well worth your time. The wine is very good AND Todd is an interesting fellow. If you enjoy Todd’s approach, he recommends David Arthur Vineyards as another winery in Napa Valley that embraces a similar approach to the public. He admits to playing up the reputation a bit, but mostly this is just who he is. The flamboyant style is enhanced by his big toys inclination, the car racing and penchant for long hours of partying. In fact, he touched on an obscure group of winery owners that decided to drop out of the Napa Valley Vintners Association, because it promoted exclusivity and a high-brow image. They call the group GONAD, an acronym for the “Gastronomic Order of the Nonsensical and Dissipatory”. One day soon, I need to do more research on this group (future piece?). Drop GONAD into Google and you will get a few tid-bits… Todd has a high regard for this rebel cause and frowns on the stuffy, French aspirations of many of the producers in the valley. Providing a relaxed, unique wine experience is his goal at the winery and is also his view of the American Wine Experience. He absolutely loves the fact that his name has been the title of some of the longest running threads appearing on Robert Parker’s bulletin board. There was more. I didn’t dip into the stories much… One day, I will have to sit with Todd, sample his wines, discuss more of his past and explore his passion for wine in greater depth. Todd, keep up the good fight! Someone should be changing the perception of wine in the U.S. – wine is NOT only for special occasions and formal dinners! P.S. – As I do more of these interviews, I have come to learn, it is the people who market wine that create the aura surrounding the product. Many winemakers in Napa are also growers and ultimately farmers at heart: down-to-earth people missing the pretentiousness of the service side of the industry. I really enjoy these people and look forward to meeting many more! Drank over a four hour decant. Nose after pour was full of menthol and alcohol that almost masked the other more subtle notes of black plum, currant and tobacco. The acidity was very high… a definite food wine, needing the accompaniment of red meat, or ribs. The texture filled the mouth with chewy tannins that were soft, but a touch rustic. The wine was definitely a good candidate for an extended decant. After one hour, it was still showing big alcohol and menthol – overpowering a black cherry and raspberry palate peaking through. After three hours, the alcohol had blown off and subtler notes appeared. The fruit had moved forward and the plum and currant were now dominating. The menthol became just a subtle after-taste. The mid-palate was full of tobacco moving to a long finish of dark chocolate that was a touch bitter and lasted forever… This was a premium Napa Cabernet showing its chops. 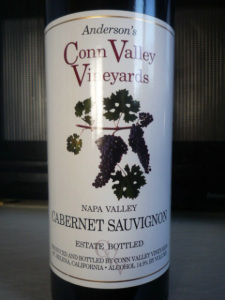 For those that love the Napa Cab experience, this is an excellent example of one of the best. Another 1-2 years in the bottle and this wine will be hitting its peak. A suggested optimum drinking window: 2016-2018. This interview introduced me to a different approach to winemaking. During this series, there have been interviews with wine industry professionals having extensive formal training and degrees in Chemistry, Biology, Oenology, etc. These professionals focused on the technical approach to development of structure in wine. The discussion quite notably lacked an emphasis on nuance and balance. Maybe… it takes a Burgundy style Pinot Noir producer to truly do the topic justice? Here, you will find a winemaking philosophy that is less about the science and more about a “feel” for the process. If you want to believe winemaking can be “art”… join me in meeting Kathleen Inman. Kathleen grew up in a family of teetotalers and was not introduced to wine until her college years at UC-Santa Barbara. She took a few wine appreciation classes there and spent the Summers working at Napa Creek Winery. At the time, it never occurred to her that it could become a career. It was during this time she met Simon Inman, married and made the move to England. She found her love of gardening during the years in England. On a small estate there, she experimented with organic growing methods and raised a few cattle in a small pasture. Kathleen and Simon spent these years pursuing professional careers, while nurturing a love of fine wine and cuisine. The dream of making great Pinot Noir eventually drew her back to California. In 1998, Kathleen and Simon moved back to Northern California and she began the search for an appropriate vineyard site for Pinot Noir and Pinot Gris. While the search went on, she began volunteering at local wineries and attending Oenology classes at UC-Davis. She eventually found an old farm in the midst of Pinot Noir country in the Russian River Valley and by 2000 had planted the vineyard and begun a renovation of the old farmhouse. In 2002, Inman Family Wines released its first vintage. The vineyards are organically farmed and the winery uses sustainable practices in its operation. Kathleen handled the vineyards and winery by herself, with no full-time employees until 2010. She truly built the business from the ground-up. Today, Inman Family Wines produces roughly 5000 cases of which 80% is sold direct-to-consumer and the other 20% is distributed by Broadbent Selections to the restaurant trade. In Napa Valley, you don’t hear much talk about the topics of low-alcohol, nuanced flavors, or balance. Napa offers a predominance of big, alcoholic fruit-bombs. If the wine can strike a balance, these can be truly amazing wines. Although, driving big fruit, big acid and big tannins in equal parts, can be a significant challenge, especially during difficult vintages . When these wines miss the mark, they can be difficult to appreciate – drink now, OR aged. It would be interesting to see a few more winemakers with Kathleen’s type of approach in Napa. When I first started drinking wine, I was introduced to Napa producers first. It was all I knew and I loved premium Napa wines. When I started sampling more French and Italian reds, less manipulation and more focus on structure and balance started to build in importance. Many Burgundy style producers often take this even a step further, looking to add elegance and nuance to the final product. These kind of goals are not the result of an exclusively technical approach, but more from the “art” of building a fine wine. This is Kathleen’s focus. Kathleen loves growing vegetables and fruits, cooking farm-to-table and ultimately sharing the result with friends and family. If you add organic and sustainable practices to the mix, it is easier to see the motivation behind focusing on the natural flavors and discouraging manipulation. She uses only milder French oak (no American oak), never more than 25% new barrels, with a preference for a subtle oak influence. She believes manipulation destroys aging potential and is a big fan of the nuances age can bring to a well-made wine. The fermentation is done with only naturally occurring yeast at her location, which as it turns out, was not easily identifiable when the lees were sent out for analysis. Another added natural complexity to the wine. This fascination with producing complex wine, while expressing the location AND limiting manipulation of the fruit has led to to a few unorthodox ideas. Kathleen blends wines produced from individual blocks of vines with a special end-goal in mind. She selects three to five blocks to harvest on a range of dates, ferments and makes the individual block designate wines separately. The wine from the first early pick is always very acidic, low in alcohol and floral. As you would imagine, the final late season pick is very fruity, high in alcohol and more textured. This kind of winemaking and blending can only be done with estate vineyards. Purchased fruit is always harvested on a single pass, but this Olivet Grange Vineyard is Kathleen’s baby. She never picks for optimum brix (sugar level) like most growers. She is looking for optimum acidity (pH), appropriate phenolic development, skin and pip texture… Kathleen often decides to harvest on a “feel” for the proper maturity. Kathleen has become a fan of whole cluster fermentation in making Pinot Noir, stems and all. She feels stem inclusion in full clusters actually increases the availability of carbon dioxide in the must and pushes the ferment naturally towards carbonic maceration. There is a delicate balance at play here. These processes can make it difficult to express tannins in the wine, removing one of the primary components of a structured red. While Pinot Noir is not high in tannins, some is necessary to provide the appropriate mouth-feel. These are not traditional Pinot Noir ideas, but for me, it makes sense. The early harvest strategy sets the perfect stage for these techniques to help retain the fruity flavor components. She has gradually increased the amount of whole cluster fermentation in the mix, to a full 100% in the 2013 vintage. Kathleen feels the estate OGV site produces floral aromatics in both the Pinot Noir and Pinot Gris grown there, with the Pinot Gris in particular picking up the iron minerality from the soil. Personally, I can taste the minerality in the Pinot Noir, but it is not tomato, or blood flavors typical of iron components as can show in Ribiero del Duero Tempranillo (for example). It is a “wet rock” character to me. She also feels the Pinot Noir from this vineyard consistently produces tart cherry and rhubarb flavors, unlike the candied, or fresh, sweet cherry typical of Carneros Pinot Noir (for example). Kathleen has been experimenting with a small quantity of Zinfandel fruit the last few years. She is looking to achieve the perfect pizza wine, with lower alcohol, a black fruit profile, higher acidity in a more restrained style. She has a soft spot for Ridge Zinfandel. The hope is to hit on just the right style using fruit from a Sonoma County vineyard location. One day she would like to try her hand at Grenache in this style too! The first Inman Family Pinot Noir I tasted was at a Thanksgiving Turkey Dinner four years ago. It was a beautifully paired combination. That 2006 vintage was arguably one of the most balanced wines I have ever tasted. The Inman Family wines would seem best suited to a specific group of wine enthusiasts. Not meant to be drunk as an aperitif, but always with food. Not as a daily drinker, but when you can focus on and appreciate the structure… and especially not when the audience is seeking a fruity, cherry concoction. This is a classic version of New World Pinot Noir, made with restraint and artistic flair and is a tremendous value. The 2006 was a prettier vintage. It was a touch more fruit forward and a little more balanced, but this is still a wonderful effort. The nose has aromas of sour red and black cherries, dark chocolate, minerality and a floral note. The color has picked up a brownish tinge showing some age and the freshness is not all there, but the palate is still showing strong acidity making the wine very lively in the mouth. The tannins are subdued and the alcohol is very well integrated. The texture is gorgeous – very soft and pleasant. This is old world style wine, focusing on balance and complexity. 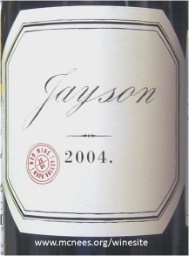 The fruit is in front but subtle, moving to a mid-palate with vanilla, oak, leather and mineral aspects with a medium-long finish of bitter chocolate. This is more of a food wine, than a patio sipper. I enjoyed this California Pinot Noir expressing a less typical point of view. Investigating a broad array of wine styles. Understanding different varietals and the impact of various terroirs on each. Learning winemaking techniques that add interest to these elements. I came away from the interview wanting to make wine myself, but then again, I am a tinkerer who loves wine too. I will need to catch-up with Kale again. I was too interested in his explorations and did not get a chance to discuss the industry and his more conventional endeavors. Kale works hard to capture what the fruit offers in these wines. He also feels it is important to honor the Owner’s (Jayson Pahlmeyer) vision and respect the history and legacy of the label. Our discussion regarding white wines at Pahlmeyer took us down an interesting path. Kale is definitely working to create distinctive and diverse styles. Previously, as winemaker at Cliff Lede, his Sauvignon Blanc was fermented in stainless and cement and not always aged on the lees. He felt it was the right decision, based on the approach of the winery and the fruit. At Pahlmeyer, they are making 100% barrel fermented Chardonnay aged in 100% new oak. They use aggressive stirring of the lees during fermentation, age on the lees and even swap the lees across different batches, depending on the flavor character. They also include a secondary malolactic fermentation to soften the wine even further. The resulting wine is an opulent, rich, soft, textured Chardonnay. Kale prefers not to filter wines, if possible. Pahlmeyer produces roughly 15,000 cases of Napa origin and 7,000 cases of Sonoma origin wine. 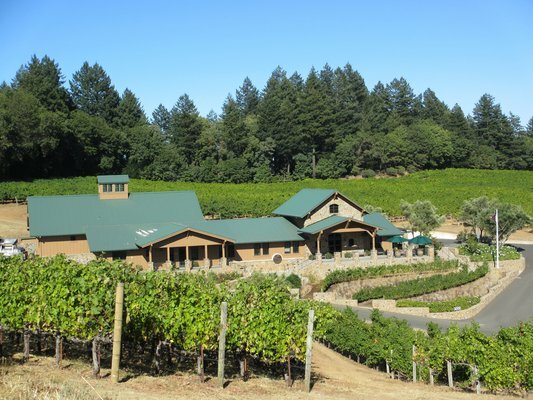 1) The Alder Springs Vineyard is at higher elevation in the cooler climate Mendocino area. Typically the type of location better suited to Pinot Noir, or Chardonnay, but instead this area struck him as a great location to make Syrah. Production – roughly 150 cases annually. If you are familiar with the Northern Rhone area of France, the setting for this vineyard will compare more closely with Cote-Rotie AOC, than Napa. Kale is looking for the Northern Rhone influence, but working to accent the style with winemaking techniques that can offer a fusion with the New World. Currently, he is using whole cluster fermentation to add a fruit-forward aspect. For those who have not experienced Cote-Rotie wines, a typical profile would be: lower alcohol, floral, rich black fruits, savory meat and olive tapenade with a heavy texture that can approach oily. The great Northern Rhones are spectacularly complex with a structure and balance that can rival great Bordeaux. 2) A warm-climate Southern Rhone style wine from Sonoma County? Not sure I have seen GSM (or the like) there. While Bordeaux, Burgundy and Puglia style wines predominate in the area, Kale found a location that he feels can support his vision: Kick Ranch Vineyard. Again, he is attempting to revise perception and convention. Production – roughly 200 cases annually. Finding the best vineyard location that offers warm to hot days, but also cool to cold nights. Controlling the canopy management (pruning strategy) to ensure just enough, but not too much sun. Managing the availability of water to the vines. Warm-climate fruit typically has a big, soft character… and if you’re not careful, the end-result can be grape juice, instead of wine. This style in particular seems to require a winemaker actively working on the farm helping the vineyard manager to develop the right level of tannins and acidity. With the wrong fruit, this style requires manipulation and additives to make it more enjoyable. Kale has signed contracts with both vineyards which will allow him more control and input into the canopy management and harvest strategy. Growers typically harvest fruit in a single pass, usually when brix (sugar level) is highest. In contrast, if a winery can harvest select rows, or blocks individually, or choose to pick one row early and another late, it will add substantially to the complexity and structure of the wine. Without this approach, it is very difficult to achieve a balanced wine in a warm-climate setting. His favorite part of the job is the time in the vineyards… working with the vineyard managers to develop the right strategy to support Kale’s vision for the wines. He believes his greatest challenge is improving control of the process from the vineyard to the winery through to aging. Each vintage is his effort to leave a personal touch that defines the wine. The idea is to highlight characteristics that make the wines interesting and represent their place of origin. He is not looking to develop a “House”, or “Winemaker’s” style. Each vintage celebrates the diversity of each growing season and each label represents a range of character and profiles. In every instance, the only consistency is striving for structure and balance. Kale’s approach to wine can be summed up in a single sentence… “In the case of every wine, I try to achieve the most interesting profile I can, in each style.” I look forward to future tastings, where my palate can enjoy a real adventure in wine, without leaving my seat! When you talk with winemakers regularly as I do, you begin to expect being regaled about a passionate connection to wine and the industry. Bill takes you down a different path, focusing on the process and science of wine. He dives right into conversation regarding the chemistry as if it were the only approach to winemaking. In our conversation, we touched on building premium wines, his formative years in New Zealand and moving from his legacy at Duckhorn, to his future at Goosecross Cellars. Bill was raised in New Zealand and his early years were far from the wine scene. He chose Hospitality and Resort Management as a career. The training included an introduction to Wine and Culinary Program Management, his first exposure to the wine industry. During his travels in South Africa, wine continued to intrigue him. Upon returning, he was introduced to Nick Sage (currently with Eastern Institute of Technology Wine and Spirits) and Kate Radburnd (winemaker CJ Pask Winery) and their influence moved him to a full commitment to wine as a career. He worked with Kate at CJ Pask for five years learning the craft. CJ Pask is in the Hawkes Bay region and focuses on Syrah and Merlot. New Zealand is well known around the world for quality Sauvignon Blanc and Pinot Noir, but Hawkes Bay has a long tradition with warmer climate varietals. Bill eventually made the decision to come to Napa and expand his knowledge of Bordeaux varietals. 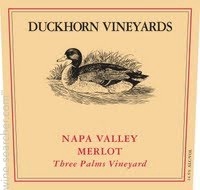 He joined Duckhorn and soon became winemaker for their new label at the time: Paraduxx. Bill’s experience at Duckhorn was steeped in the tradition associated with the brand. Tom Rinaldi was the founding winemaker and had a significant influence, sharing and handing-off his passion for structured U.S. Merlot in an Old-World style. We also discussed the style of Chardonnay at Duckhorn: acidic, minimum of oak, aggressive stirring of the lees and never a secondary Malolactic Fermentation. A very specific style aimed at being fresh, with a bite and a rounder mouth-feel. Bill was later promoted to Executive Winemaker and found his responsibilities were taking him too far afield from the winemaking itself. The role included added travel and took him away from his young family too frequently. He soon came to realize, this career direction was not a good fit. 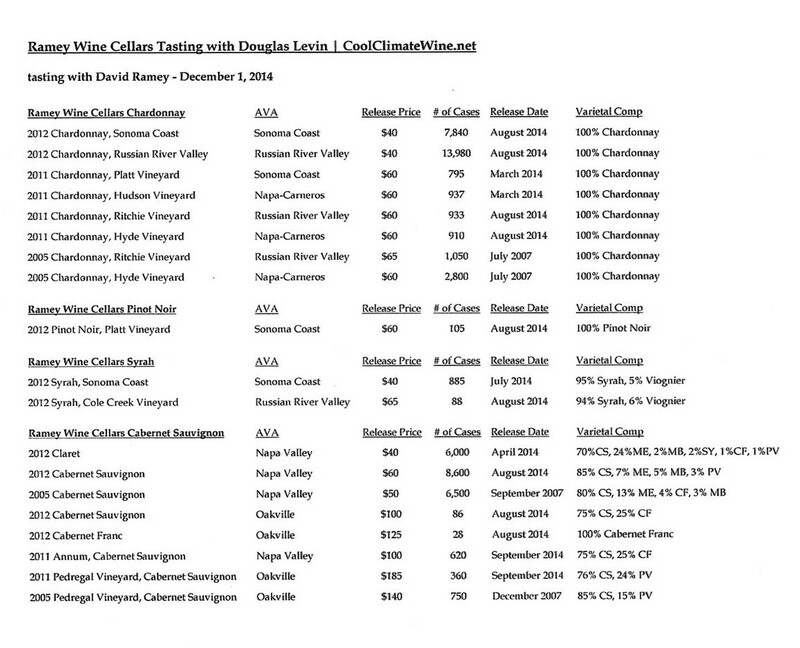 The Wine DOCG – “So, Bill why do you think there is so much lousy Merlot made in the U.S.? I have heard this line of reasoning before. Makes sense from the big picture perspective, but if you were a premium Merlot fan, it appeared tragic… For me it manifested in a personal cause never to accept the comment, “but, I don’t like Merlot!” I have converted many a “Merlot hater” over the years. Recent figures from the U.S. International Trade Organization show that 9% of all wine sold in the U.S. is still Merlot and it is the 4th most sold wine in the U.S. This is down substantially from 16% in its heyday. I still believe there is too much Merlot grown in locations like the Central California inland valleys and made into inexpensive red wine. Personally, I am a big fan of wine made from Merlot grown in the mountains above the Napa Valley floor. If you love big, bold Merlot look to the Howell and Spring Mountain areas. In my experience, Bill is a departure from most New World winemakers. He talks like a Bordeaux wonk: “Flavors look out for themselves in wine” and “focus on the structure”. I can really connect with his point of view. In a warmer (getting warmer too) climate growing area like Napa, the fruit is going to be ripe and intensely fruity, but structure is not always easy to find. No purist winemaker wants to add acid, or ferment reds with a large quantity of stems to get tannins… If you focus on structure first in Napa, the flavors are more likely to follow on their own. Although Bill feels Oak is important to “rounding-out” a wine, he tries to stay away from too much new American Oak and is not a fan of over-oaked whites, OR reds. I like his thinking on a common wine style controversy: “Drink Now” vs. “For Bottle Aging”. It is very difficult to make wines that can succeed at being both. Bill firmly believes it is better to make the two different styles separately, rather than make a single wine capable of both. This kind of approach can produce more consistency year over year. Especially, when considering how vintage variation can effect wine style. In Bill’s view, vineyard designate wines can be somewhat problematic. They can be very singular in their approach, missing the complexity of blended wines. 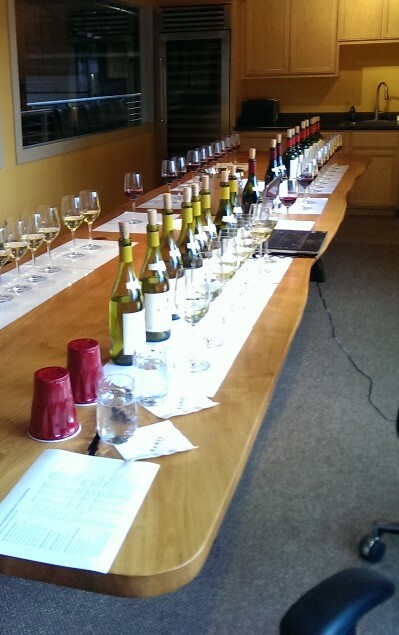 We talked about same varietal blending across vineyards and across individual blocks. We also touched on varietal blending to add complexity. You can hear the conviction in his voice during this discussion. It is obvious this is his element. When I asked him about his favorite activity as a winemaker, he answered immediately: “in the winery, making the wine and blending for flavors/aromas.” He says, he still has not made the “perfect wine” and it drives him to continue searching, experimenting and blending to achieve his goal. With a more scientific approach to wine, it was not a surprise to hear a more objective approach to the mystical French idea of terroir. When posed with the question… after a pause, he noted, “There are probably no flavors imparted by soil in the vineyards. The climate, environment and access to water are more likely to be important factors.” I agree. The supposed controversy surrounding terroir’s impact on the character of wine is ridiculous. Terroir by definition is not just about soil, it is the complete vineyard environment defining the conditions under which the vine grows and ripens fruit. There is too much empirical evidence supporting the specific influences to take the naysayers seriously. The winery was sold earlier this year to Christi Coors (Golden Equity Investments -no, not Coors Brewing Company) and the winery began looking for a Head Winemaker. Bill was soon selected as a great fit for the new ownership. Geoff Gorsuch one of the previous Owners and Winemaker for the past 28 years and Colleen Topper (Tasting Room Manager) will stay on for the first year, providing some continuity. “A “house style” (style of wine a label is known for) can be a goal, to a degree, but not so much that it drives extensive winemaker manipulation, especially to mask vintage variation. Wines must be allowed to express where they are from “, according to Bill. “Manipulated wine can be too generic”… never the goal of a premium wine. Goosecross has 9 acres of estate vineyards off State Lane in Napa Valley and Bill is looking forward to capturing the location in the wines. The soil is rocky and the terrain is hilly, creating micro-climates that can cause variation in the fruit profile. He believes this area East of the river produces Cabernet Sauvignon with blueberry and/or violet aromas. A unique characteristic compared to the balance of the valley floor. We also talked about fighting the urge to make generic Chardonnay. It sells well, but is missing any uniquely recognizable character. He prefers the very acidic, less manipulated style, which pairs well with richer foods. Goosecross sales currently are 100% direct to consumer, but there is a plan to introduce a new label next year that will be intended entirely for the distribution channel, focused primarily on the restaurant trade. You can hear the energy in his voice when he talks about the future at Goosecross. It seems Bill is excited about the challenge and ready for the opportunity to put his stamp on future vintages. Good luck and I look forward to tasting your new wines! Please note, while Bill spent many years with Duckhorn, he was not the winemaker in 1999 when this wine was bottled. The alcohol is blowing off now. The nose is of black plum and blackberry, with a spicy cinnamon and clove character. Rather simple on the palate. The fruit is subdued, but in front still, with a mid-palate of powerful clove. The medium length finish is a mild, bitter dark chocolate. The bitterness becomes sour at the very end. The tannins are still present, but minimal and the acidity is still medium high. I was disappointed by the texture. The mouth-feel was a touch watery. This is a few years past its prime, but is not tasting oxidized yet. Still enjoyable and will definitely pair well with the beef that will be accompanying it. The wine is still changing. The fruit is continuing to subside on the palate, but the flavor of sour strawberry is beginning to appear. The texture is continuing to evolve. The finish is lengthening and adding black pepper. The tannins are now a bit chewy. The acidity is becoming more prominent and the mouth-feel is building softness. Patience is paying off and the potential of this wine is starting to show. Amazing that a 15 year old bottle of wine can continue to evolve for two hours in the decanter! After 20 years of my wife and I working our way through the 600+ wineries in Napa Valley, we have learned a thing, or two. One of those hard-earned gems is: if you want to find consistently big, complex Cabernet Sauvignon, follow the Napa mountain roads. While the valley floor locations like the Rutherford and Stags Leap areas (AVA’s) produce great cabs too, the most structured wines with highly concentrated flavor profiles are found along the roads to the top of these mountains: Veeder, Spring, Howell, Diamond and Atlas. Our original Seavey Vineyards visit was while on one of these mountain journeys up to Howell Mountain. I ran into Seavey wines about five years ago through the purchase of their 2000 vintage Signature Cab from an online retailer. I mention the source in passing, to highlight the additional avenues available for discovery of great wines. When you understand your palate well enough to purchase wine without tasting, sources such as online retailers, flash sites, brokers, and auctions become very viable options. Follow this link for more info on the topic: “What a Waste of Wine & Money?” When you are able to identify and clearly describe wine characteristics you enjoy, it becomes easier to choose wines from critics’ notes and reviews. These hillside locations produce a fruit flavor profile that seems to be a good match for me and it may be for you too. The vineyards are planted on very poor soils, making the vines work very hard to ripen the fruit. The result tends to be highly concentrated flavors. Wines seem to be catalogued in my brain based on memory of place and experience. I enjoy this quirky aspect. When visiting wineries, this idea brings me closer to the whole wine concept of terroir and helps me think of each wine as a living thing with its own evolution. Understanding the “feel” of an estate winery is important, if you want your tasting experience to be memorable. Your first impression at Seavey provides a welcoming atmosphere of farm animals and dogs with beautiful vineyards as a backdrop. The world just seems a little slower here. The employees you meet are relaxed and welcoming. This is quite different from the busy, large production wineries on the Napa Valley floor. The second you drive up, you get that family winery feel. Appointments are necessary, but anyone can call to join them for a paid tasting and potentially get a chance to meet Jim, or Art & Dorie – one of the current second generations owners. The founders of the winery and first owners were Bill and Mary Seavey. The original vision for this property purchased some 30 years ago was to create a semi-retirement ranch/farm escape destination. Bill was a corporate lawyer out of San Francisco looking to slow down. Having done some legal work for a local Napa winery, he arrived at the idea of purchasing some land in a scenic spot where they could raise a few animals and grow wine grapes. When you visit the property now, it still reflects some of that original founding idea. This is a very down-to-earth organization, at a very rustic and scenic site. Seavey produces less than 5,000 cases of wine per year. Tiny production compared to the big brands, but in the world of commercial wineries, this means an opportunity to focus on premium quality. When the focus is not on vineyard yield and volume of wine produced, each vintage can dictate its own best vineyard management and harvest strategy. This allows Jim to follow his passion… focus on the vineyards, improve the quality of the fruit and help nurture the wine to express not only location, but also reflect the quintessential, big Napa Valley Cabernet Sauvignon the winery is known for. Jim and I had an opportunity to discuss winemaking, the winery and his life recently and this is the story. Jim is one of those lucky people who had a pretty clear picture of where he was headed at an early age. Growing up in Utah, he was exposed to an outdoor lifestyle and was taken by it. So, when his father encouraged him to follow his passion, it moved him toward a profession that would allow him to work outdoors. His love of plants and botany then led him to a BS in Biology from Gonzaga. The undergrad years had him immersed in a party lifestyle and experimenting first with brewing his own beer and then later homemade wine. Conveniently, this pursuit also seemed to be of great interest to the women in his life at the time. It offered plenty of motivation to continue exploring winemaking as a profession. It was during these years, that Jim also came to realize winemaking could offer him the path to the outdoor life he coveted. After graduating, he escaped for a few years, enjoying some youthful adventure working in the vineyards down-under in New Zealand – before returning to buckle-down and complete his degree in Viticulture and Oenology at UC Davis. Jim credits Alan Tenscher (winemaker at Franciscan) as being his first real inspiration and mentor. His time spent assisting Alan with research on Pierce’s Disease was where he found his passion for vineyard management. Jim spent his winemaking internship at Robert Mondavi and then a lengthy apprenticeship at Stags Leap Cellars, before accepting the position as head winemaker at Seavey. Seavey has been producing big, bold Napa cabs since their first vintage exactly 25 years ago. Jim joined the team as Head Winemaker in 2011 and has been committed to maintaining that reputation with a very specific eye on improving quality through improved vineyard management. Personally, I am a big fan of this kind of thinking. Jim is constantly tinkering with ideas to improve fruit quality. His current focus is canopy management. Pruning each individual vine to achieve just the right amount of leaf structure to shade the grape clusters. This is labor intensive, time-consuming work and one of Jim’s favorite activities at the winery. Jim’s fanatic attention to perfect sunlight conditions for each block of vines is what ensures the proper ripening of the Cabernet Sauvignon fruit and the development of varietally correct flavors. This is the same idea that led Galileo to coin his famous phrase 500 years ago: “Wine is sunlight held together by water” – or the similar title of this piece: Wine – Liquid Sunshine. Managing the leaf canopy differently in cooler, or more shaded areas and consequently adjusting harvest time for individual vineyard blocks can be a powerful tool in developing varied flavor profiles in the fruit. A similar diversity in flavors can also be achieved by managing the canopy differently in vineyard blocks with poorer soils, or those with varying water availability. Blending the fruit and/or wine made from different blocks can add complexity, but equally as important, it can also allow a more consistent profile from vintage to vintage. This technique can allow the winemaker to develop a “house style” for the winery by identifying individual characteristics of each block and blending the fruit each year to achieve the complexity and structure required. Seavey has 19 different blocks of Cabernet Sauvignon vines, all in varying growing conditions. Some wineries that perform this kind of block blending will call the resulting wines a “cuvee”. This is a departure from the “vineyard designate” philosophy that other wineries may employ. Jim works hard to coax more concentration out of the fruit. When you are making a wine intended for bottle aging, one of the challenges is to create a fruit profile that can balance the high acidity and tannins needed for that kind of structure. Personally, I prefer wines where the winemaker pays special attention to texture during the “building” of a wine profile. Tannins can present in coarse, or fine profiles and have a big impact on whether a wine has the potential to be either velvety, or silky in texture as the tannins resolve in the bottle. I really appreciate that Jim has this in mind and is shooting for a “milk chocolate” consistency. According to Jim, Seavey is producing wines that should achieve their best presentation when bottle aged for 10 years, or more. Jim works with the well-known winemaker Philippe Melka as a consultant to the winery. Marketing is critical for small family wineries. When like Seavey, 80% of your sales are direct-to-consumer (source – Jim Duane), finding your audience is critical to success. Some small wineries struggle with this effort. Seavey was fortunate enough to be one of the early small production Napa producers, building a following with early big scores from Robert Parker, Jr. Although, today’s Napa has twice the competition compared to those early days and it has become even more important to understand the demand and continue to tailor product to capture it. Many wineries succumb to the allure of “popularizing” their flavor profile to improve marketability. Most that make that decision, do not succeed in changing their identity. Seavey has done a good job of understanding their core customer, but it will be important for them to stay in touch… 25 years of making wine represents generational changes and feedback will become more important than ever. This is a monster cab. If you are a big Robert Parker fan, this is his kind of wine. Initially, the nose was hot and a bit funky with a very closed flavor profile. For an 8-year-old cab, this wine is STILL drinking very young. After 3 hour decant… Much of the alcohol has blown off now, but is still present. The nose has plum, blackberry, a touch of herbaceousness and menthol. It has a very complex palate of typical Cabernet Sauvignon flavors – black fruit, leather, tar, graphite, dark chocolate and oak. The wine shows a very long bitter chocolate finish. The age has resolved the tannins somewhat and they are now medium-high, but still a bit grainy. The wine is very acidic and would be best drunk accompanying a rare steak. The texture is full, fleshy and soft. This needs more time in the bottle to come together. I am looking forward to popping the next bottle after several more years. This wine has plenty of structure to hold up into the next decade. A suggested prime drinking window might be 2017-2020.